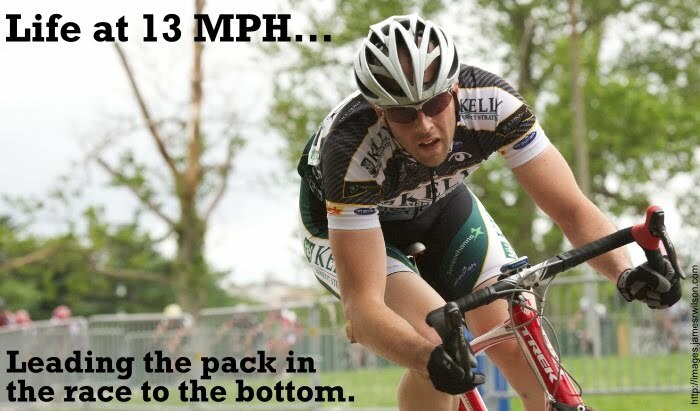 Life at 13 MPH...: Can you dig it!!!! So, if you're frightened of dying and... and you're holding on, you'll see devils tearing your life away. But if you've made your peace, then the devils are really angels, freeing you from the earth. Baltimore does not have alternate side of the street parking rules, which means that I'll be riding in slop for the next few days, blah. 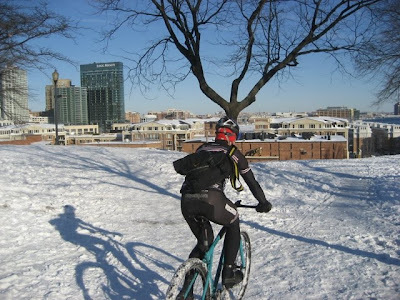 After digging out, I met up with Alex in fed hill for an espresso a some snow biking. After downing our black gold, we headed over to Federal Hill (the hill/park for which the neighborhood is named). Kids were out sledding which brings back memories of my youth as the big spot to sled in our town was just across from my back yard. It was a bit cold, but all in all it was a nice day for fun in the snow. Here is a shot of Alex rolling toward the downhill. While at the park we watched at least three kids slam into parked cars at the bottom of the hill. All parties involved were OK, but it was a little disturbing seeing a kid go face first into the grill of a Ford. After cruising around the neighborhood for a while, I rolled back to Medfield. It was delightful to have more than one gear on my bike, as I'm used to rolling on the single speed madwagon within city limits. While the gradient is pretty steady from the harbor up, i'm usualy a bit over geared (and under geared on the way down). It makes me consider other options for a commuter, but I doubt that I'll take any action in the near future.